Even with the temperature rising, I’m determined to keep knitting. 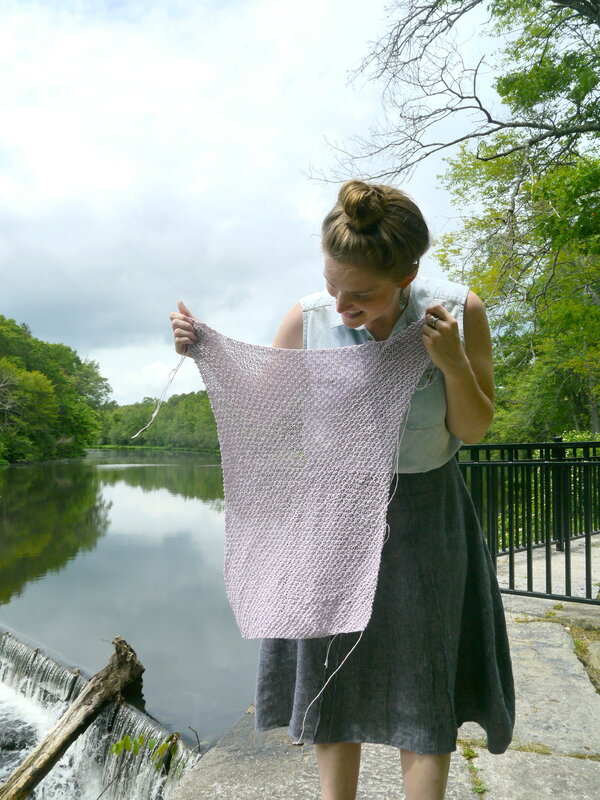 Luckily, New England summers involve beautiful sunny days and breezy nights, so I get to knit and wear my knitting, too! In the winter, I love keeping my wool projects on my lap as I work. It acts as an extra layer of warmth as I am happily knitting away through the snowy weather. In the summer, I can’t help but still want to knit, even knit with wools, but I don’t like having my knitting directly in my lap. 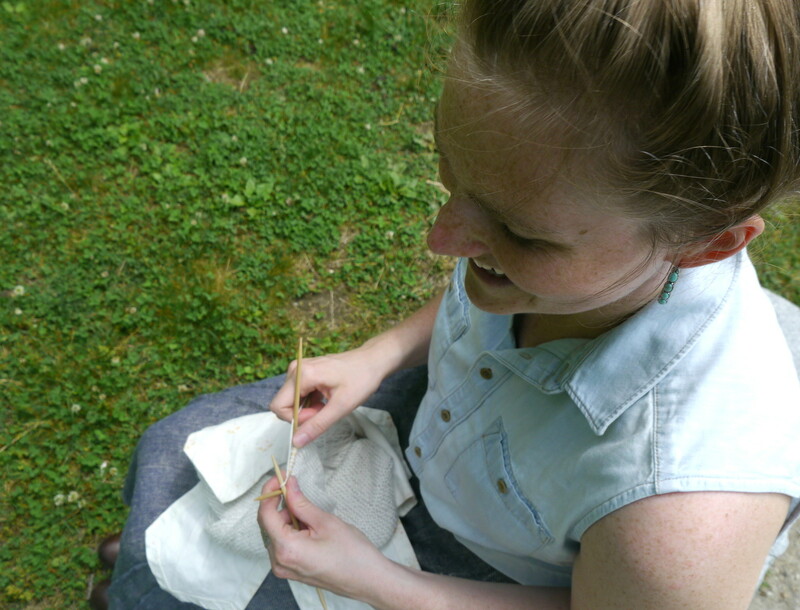 I knitted during Ashley’s and my road trip to the Squam Art Fair and kept my knitting in a little fabric pouch. Something like this is a great tool for your summer knitting. It can hold your wool during the hot summer days, separating the fiber we love from our sticky skin. I couldn’t help but purchase a large, chambray knapsack from Fringe Supply while at the art fair. It’s so beautiful and perfect for some bigger projects that I’m dying to start. Summer is also a great time to consider yarns other than your favorite wools. (Although, the heat didn’t stop me from running giddily towards a beautiful wool from Fox Fire Fibers the other night.) Right now, I am knitting with Maya for a summer shrug to wear with my favorite dresses. Let me just say – Maya, I love you so. Maya is a blend of Pima Cotton with just a touch of super soft baby alpaca. After obsessively knitting with it for the past week, I can tell you it feels like you are knitting with luxurious silk. It is fabulous! It glides through my hands even when I am a little sweaty under the hot summer sun. Captiva and Captiva Metallic are other good choices for summer knitting. This cotton/rayon blend is great to knit with and wear on a hot day. Romer is another project on my needles now. I tend to like earthier/rustic yarns, but I couldn’t help but choose the Thistle colorway – a pretty lilac shade of Captiva. I can’t wait to wear it at home in my studio as my new colorful apron. 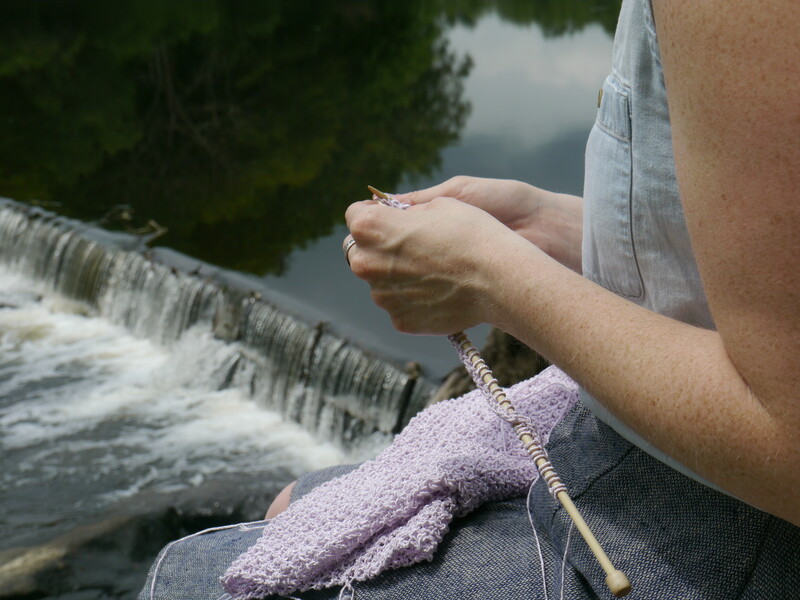 Of course there are plenty of other summer knitting options on the Berroco website – Fuji, Karma, Folio and Linus… just to name a few! I hope that knitting and beautiful weather are in your forecast soon.